Keep track of where your tasks need to be done. Toodledo makes it easy to assign tasks to a location. 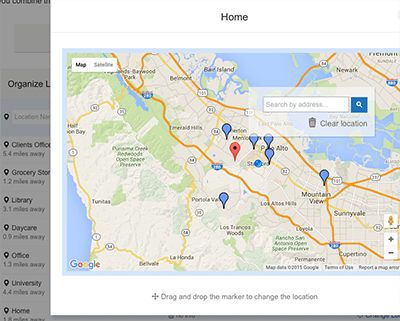 These locations will be plotted on a map so you can visually see where your tasks are located. You can also group and sort your tasks by location to quickly see what needs to get done, wherever you are. If your web browser is location aware, it will automatically update with your current location and sort your tasks by distance. 1 To manage your locations click the Account Menu in the top right corner and select "Locations" from the organize section. 2There are two ways to pick a spot on the map. You can drop a pin and then drag it around, or you can type an address into the search bar below the map. 3For each location you can specify the name as well as any details that you want to keep about that location, such as address, phone numbers, hours of operation, or other personal notes. Your current location is used for calculating distances to tasks, as described in the next section. You can set your current location from the "Current Location" box on the Location Management page. There are two options: Auto and Manual. Auto If you select "Auto" and if your web browser is location aware, it can automatically update to indicate your current position. Manual If your browser is not location aware or you prefer to keep the GPS disabled, you can set your current location manually by dropping a pin onto a map. 1 Navigate to your Tasks and click the Location Icon from the ribbon to go to the locations view. 2 Click the Action Icon to open your Action Menu, and select "Show Map". This will reveal a map with your locations plotted on it, along with your current location. 3 Sort tasks by location to have nearby tasks listed first. This is a convenient way to see what tasks you can complete near your current location.